Which places offer the best boat safari experience in Uganda? Kazinga channel is a 40km natural channel that connects Lake George and Lake Edward, and also divides Queen Elizabeth national Park into two. You can catch sight of various animals, birds and reptiles on a boat ride and on the shores of the channel. 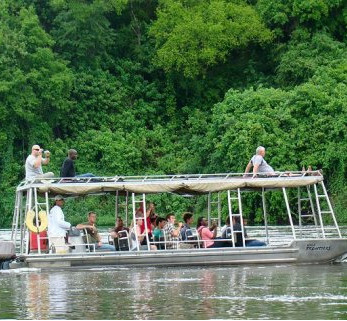 For many tourists the kazinga channel launch cruise is the highlight of their safari. You can see crocodiles along the shores, and numerous hippos along the shores and in the water. This small channel of water has the highest population of hippos in Africa! The launch cruise is a lot of fun, and gives tourists the chance to take photographs of the scenery, the animals they sight, and of themselves in the middle of such beauty. You can also see monitor lizards along the shores. These look a lot like crocodiles and are sometimes confused for baby crocodiles. These lizards are that big. It is not uncommon to catch sight of some elephants, and buffaloes especially on the afternoon rides. Buffaloes find protection in the water when they are alone and without a herd. The water gives them some bit of protection from predators. You may also get to see some predators such as lions get a drink of water in the afternoon. Other animals that you might see on your boat ride include; waterbucks, antelopes, and the unique Uganda Kob. Are there any birding opportunities? The avid bird watcher would also enjoy a boat ride on kazinga Channel. There is a variety of birdlife to be found and seen. African skimmers, martial eagles, pelicans African spoonbills, papyrus gonolek, cormorants and shoebill stork are some of the bird species you might to get see. You do not have to be an avid birdwatcher to enjoy the birding offering of the kazinga channel, the colorful array of birds would catch attention anyway. So when you visit Queen Elizabeth national park on your next Uganda safari trip, make it a point to go boating on the kazinga channel, it will be worthwhile experience. Murchison Falls is already exciting just by the fact that there are magnificent falls to see. 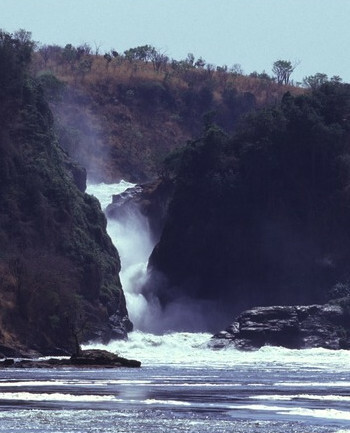 The river Nile runs through Murchison fall a national park and climaxes the show with the beautiful waterfalls. The park offers perhaps the best boat rides in all of Uganda’s game parks. With a skilled boatman, the boat can come really close to the waterfall without get into dangerous zones-just to the point where the water rises before it falls. That is exhilarating for anyone who is adventurous enough to dare. In the afternoons you can see elephants, buffaloes antelopes and a variety of birds as you move from the Para area of the park to the bottom of the falls. Hippos resting and frolicking in the water and along the shores of the river are also a common sight on these boat rides. There are crocodiles too, one of which is a man-eater. There is a sandbank on the left of the river just before the falls that has numerous crocodiles. The sight is both scary and interesting. There is a lot of history to be learnt and discovered on these boat rides. You can get off the boat at the bottom of the falls and walk up the trail that was taken by Winston Churchill, the spot where Earnest Hemmingway had his first airplane crash is nearby there too. The falls were also named by Sir Samuel baker whose boat was overturned by a hippo on a boating ride. The place is rich with history, and very scenic, the views from a boat on the Nile River are simply magnificent. The scenery along the boat ride makes the wildlife experience even better – forest – cliffs, the water fall itself and on the return trip you just might see some predators coming to water. Idi Amin renamed the falls ‘Kabalega falls” but the name was later reverted to Murchison falls. Murchison falls national park already has much to offer to those looking to experience the African wilderness while on safaris in Uganda, but add a boat ride on the Nile and a closer look at the Murchison Falls, and it becomes a more than amazing experience. Another Park that offers an amazing boat safari experience is Lake Mburo national park. A boat ride on this very beautiful peaceful lake is the perfect way. To wind down a day full of safari activity. The boat rides here take you along the shores of Lake Mburo. You can catch sight of wildlife such as zebras, antelope, and buffalo as they come to the water. Lake Mburo is also home to the large eland antelopes which you just might get to see while on a boat ride. There are also 3 different species of otters in Lake Mburo, which you might be able to see if you take a boat ride on the lake. Hippos and crocodile are also a common sight. There is also a variety of bird life to be seen such as Pelicans, Black crake, African Finfoot, Heron, Cormorant, Fish Eagle, and the elusive Shoebill Stork. In Lake Mburo national park, you can only get boat rides on the main lake. How safe are the boats? The boats in these parks are modern, up to date, well maintained and safe. There are life vests worn as a safety measure as well. Boat safaris are such a rewarding experience and all visitors to any of these parks should be encouraged to go on a boat ride at least once.